Thanks for visiting my blog and the kind words about my painting. Since I found your blog, I have really enjoyed reading about your life and your new retirement life. Yes, life really does change after retirement, however, it is still up to us to shape our future with the cards we are dealt. Thanks for sharing your writings with us. Hi Betty. Hope all is well. Wow! Wonderful project. Really, really love it. Inspiring as always. 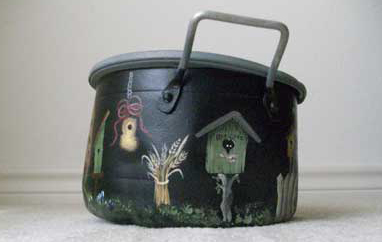 Oh my…I love the old pan and what you painted on it. So cute!! Thanks for your visit and the sweet comment on the old pan. I am having a great week, hope you are to. This is a superb project. Love to read about other’s country crafting. Perhaps you’ll visit my blog, too! Take care, and I’ll be back soon! 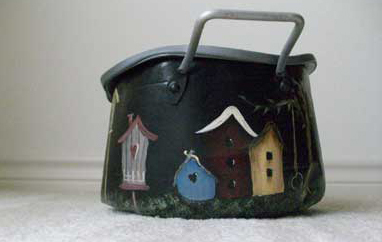 Thanks for your visit and the kind words about my painted pan. 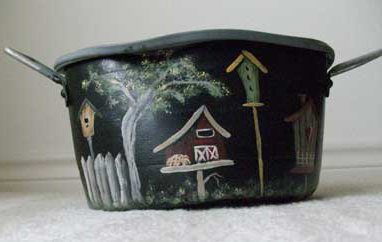 I did visit your blog and found the gardening and crafting posts to be quite interesting. I will definitely be visiting again. What a great idea! It is so neat. Good to hear from you. Hope all is well. 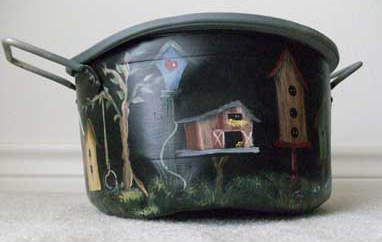 Thanks for the visit and the sweet words about my painted pan.